What a great city to end our tour throughout South America. 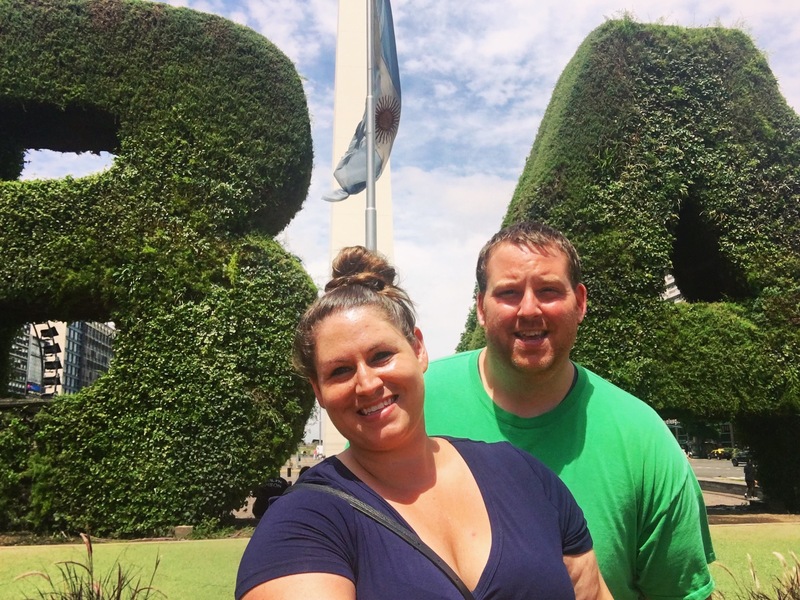 Getting Around the City: We flew into Jorge Newberry International Airport and wanted to find a cheaper way to get into the city since we have been spending so much on Uber. (Which they do have here, so thats good!) We found out about the AR bus that takes you directly into the center of the city from the airport for about $4/person. From there we took an Uber to our hotel. Much cheaper and incredibly easy as the bus leaves every 30 minutes from the airport. We also made use of Buenos Aires metro system, called the Subte. We learned, after making fools of ourselves, that you have to buy the metro card, the Sube, at one of the many convenience stores around the city. Theres one pretty much on every corner so they’re easy to find, just would have been nice to know ahead of time! The card itself costs 35 pesos, so about $2.50 (you can use one card for two people!) and you fill it up with however much you want. Each ride costs 7.50 pesos, so about $.50. It was very easy and very cheap! Only thing to note is that it stops running around 10:30pm and since nothing really gets going until 8pm, it might be hard to squeeze it in for a ride home at the end of the night. 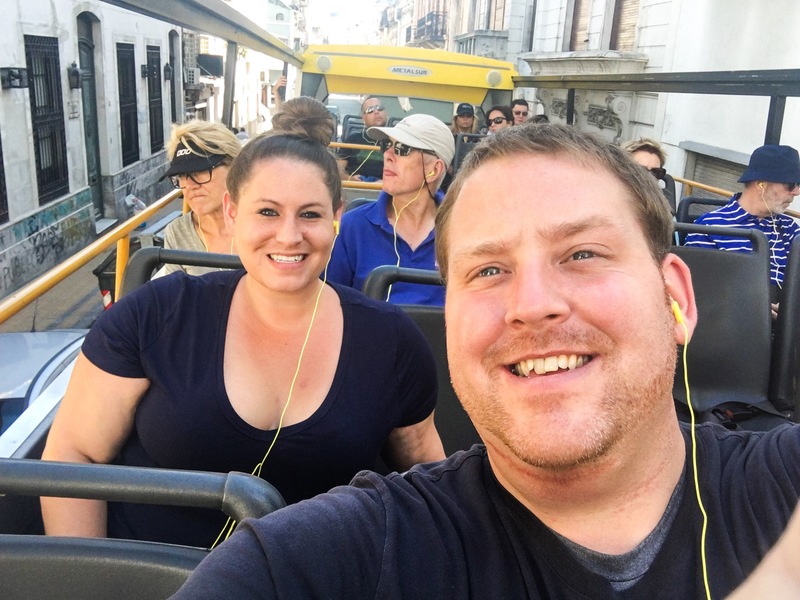 We also cheated the Buenos Aires Bus system (explained below) to take us around. 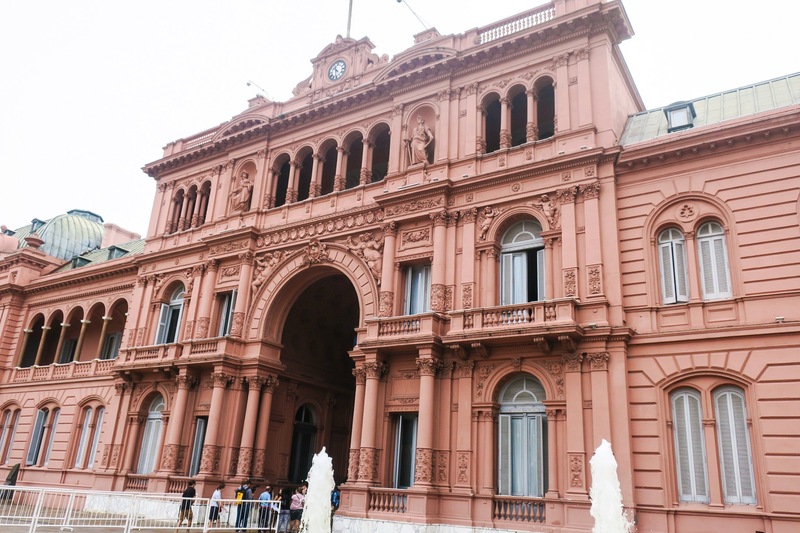 It killed two birds with one stone as we learned about the city while on it, but didnt have to pay extra to get us to the places we wanted to visit. What Did We Do? 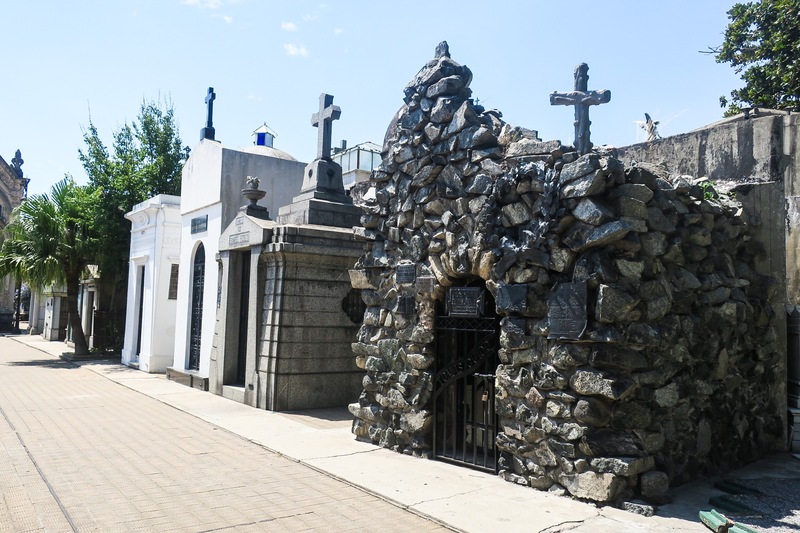 There’s so much to do in Buenos Aires and we seemed to pack all the major things in during our stay. Visitors beware, if you are visiting in the summer months, prepare to sweat… a lot. We were warned it was gonig to be very hot and were told that the natives leave during this time of year because of it, but I really dont think anything could have prepared us accurately for what we encountered. 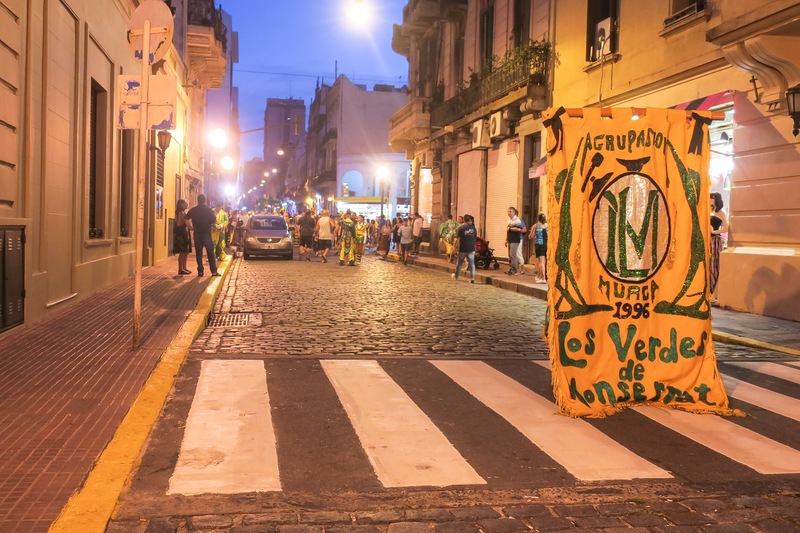 Also beware, Mondays are the new Sundays in Buenos Aires. Everything was open and thriving on Sunday but as soon as Monday rolled around.. ghost town! Definitely check the hours of operation or give whichever place you are headed to a quick call before you go. We made the mistake of just going and boy were we dissapointed.. multiple times. Florida Street houses tons of shopping to satisfy any and all cravings. We walked up and down and saw everything from clothes to shoes, electronics, tons of cell phone case shops (which I loved since I feel you can never have enough! Although, don’t worry, I resisted buying) and even some street performers. Not too far from there is the Obelisco in the center of the city. 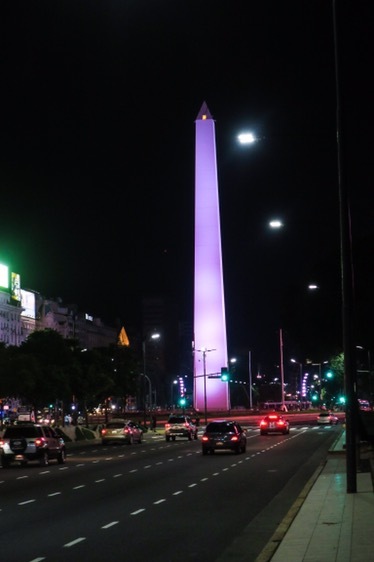 The Obelisco is a national monument that commemorates the fourth centenary of the first foundation of the city. 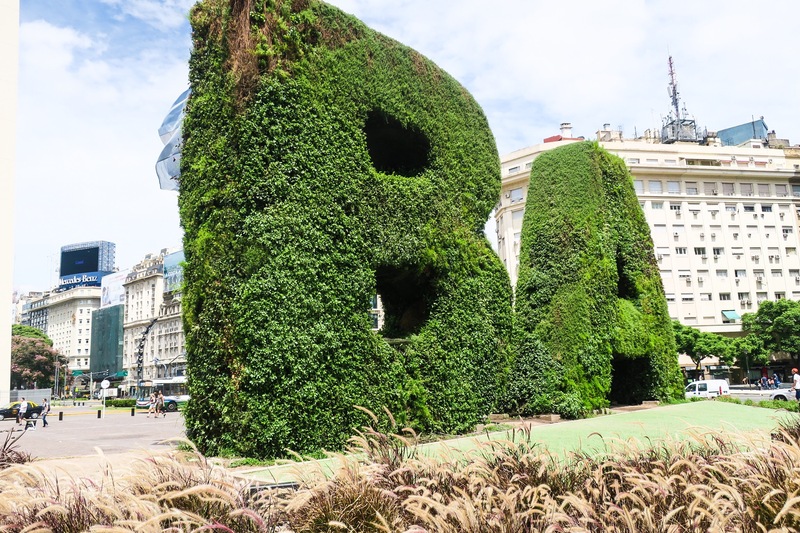 It stands tall right behind the very big hedges carved into “B” and “A” for Buenos Aires. 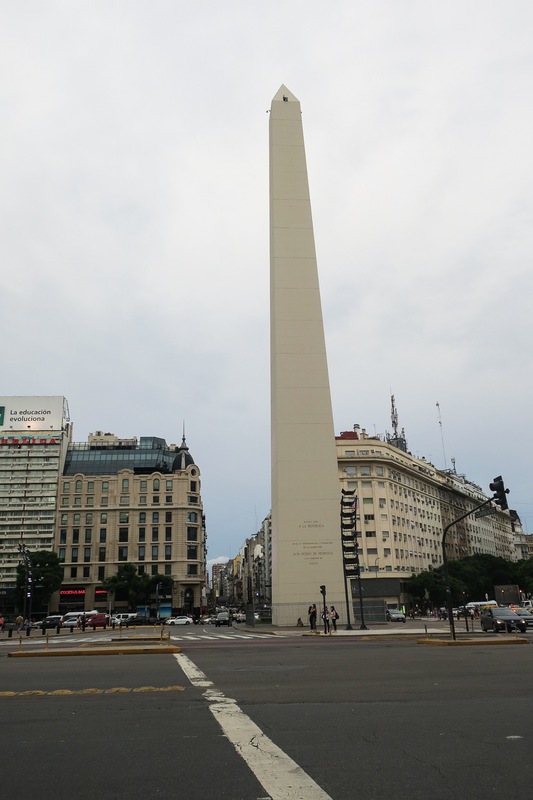 The Obelisco is located on the 9 de Julio avenue, which we learned is the widest avenue in the world, is lined with trees and has many parks down the center. That area of town reminds us of the theater district of NYC. Not as big, of course, but tall buildings with huge LED screens on the outside and many restaurants and Tango shows. 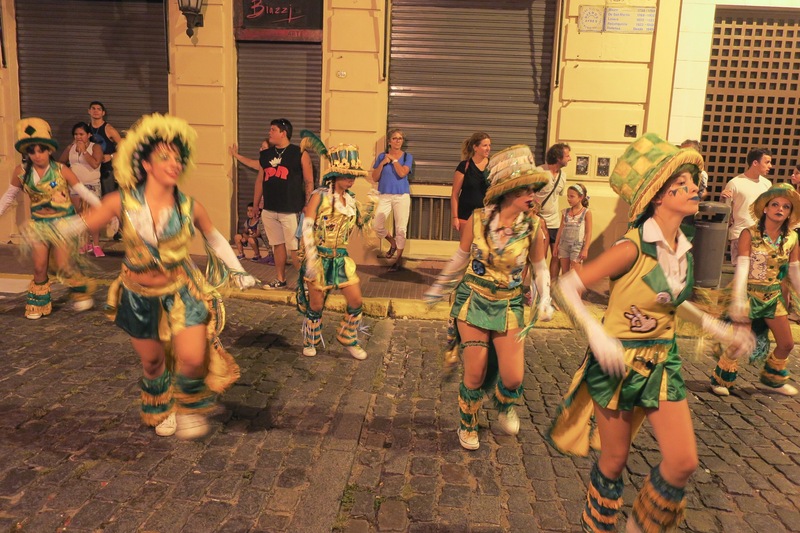 Luckily, on Saturday’s and Sunday’s in February, Buenos Aires has their Carnival. We were so happy to get to see one! 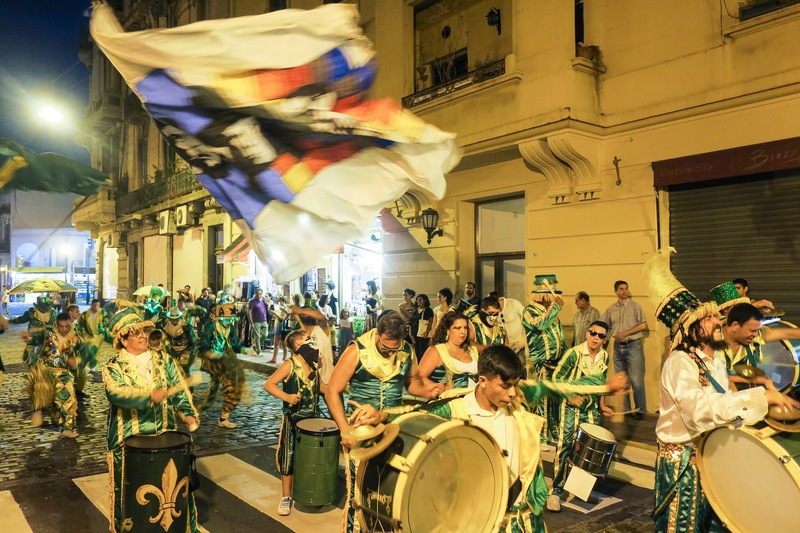 These are called a Murga Parades, which are bands of marching percussionists and dancers. 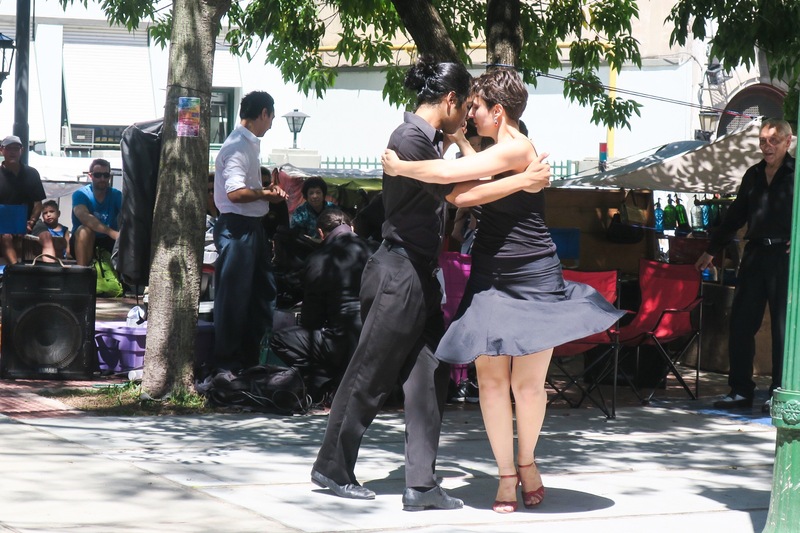 Each neighborhood dresses up in their own colors and all the dances are choreographed. From babies and toddlers to teens and adults, Everyone is included! 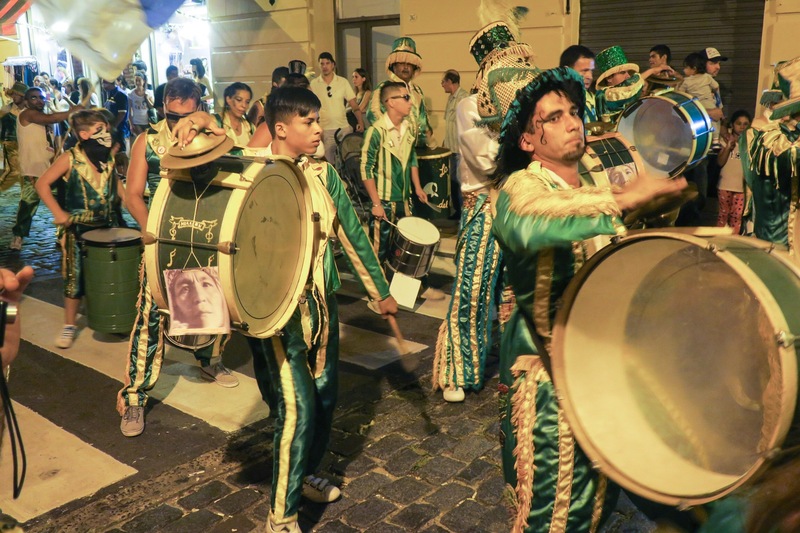 The music fills the streets and you are immediately overwhelmed with the beat of the drums and the passion radiating from everyone in the streets. 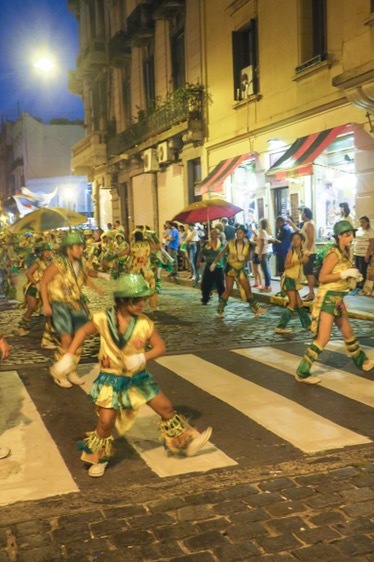 If you come to Buenos Aires during this time, dont expect the Rio, Brazil style carnival as theirs is just one huge parade. These are individual and custom to each neighborhood. You have to do some research to find them, but once you do, its worth it! 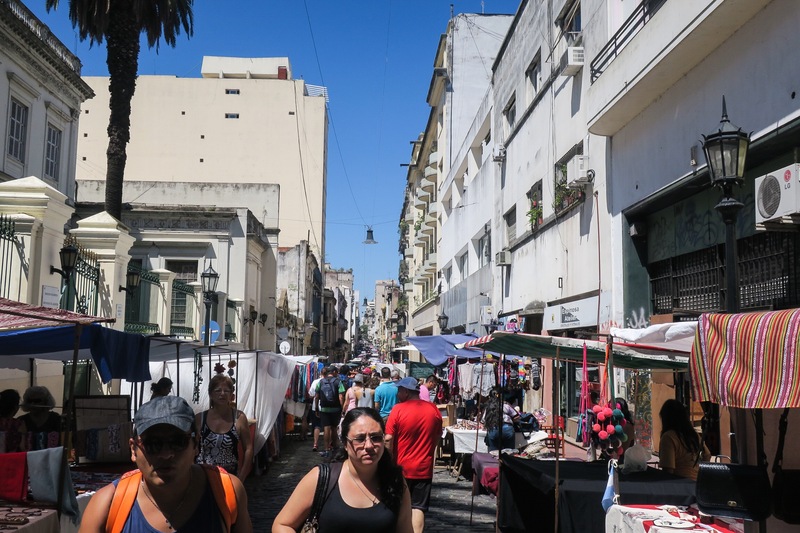 Also on Sunday’s, San Telmo has a huge market that spans 10+ blocks. That was the only good thing about staying in this area. We stepped out of our hotel and BAM! Vendor after vendor selling absolutely everything and anything you could want. Some for the tourists and some for the locals. 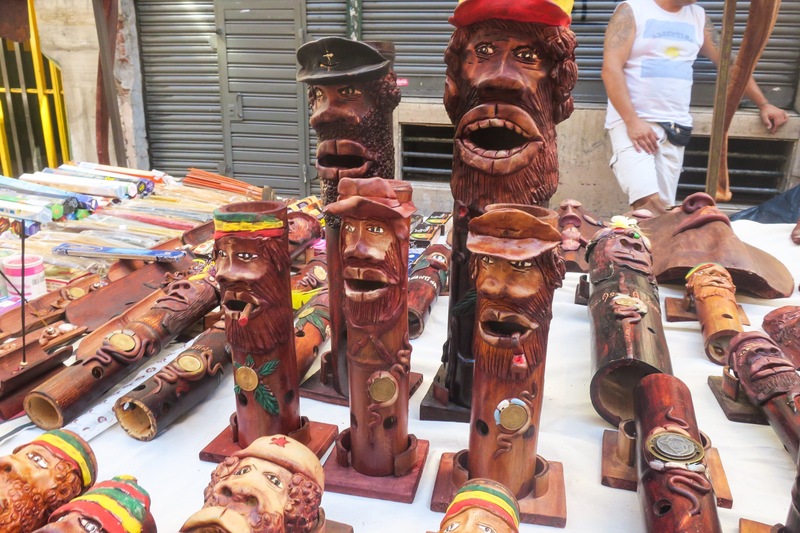 Keychains, hats, incense burners, mate tea cups, belts, art, I could go on and on. 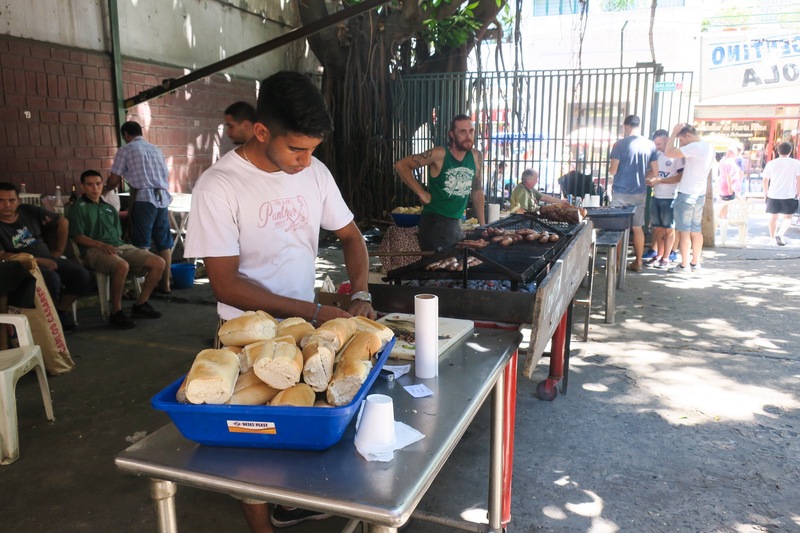 It seemed as though everyone in the city came to this market. It was packed! 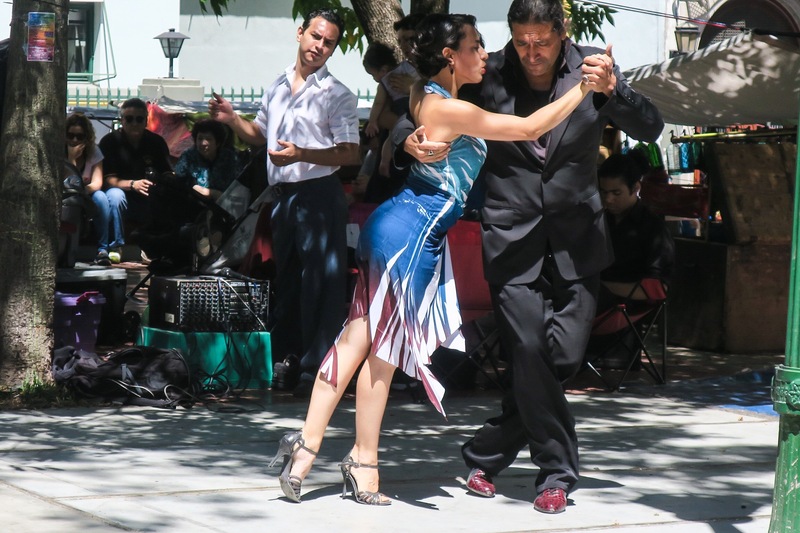 In one of the squares they had a tango show going. 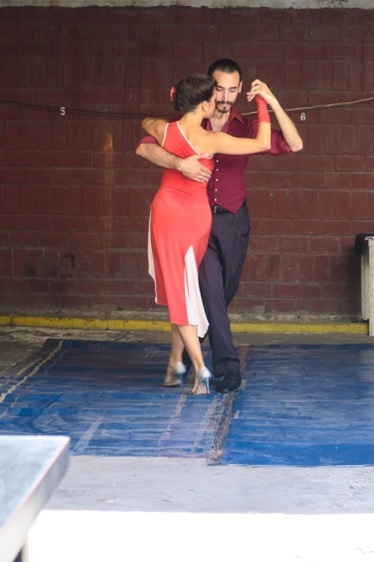 We were dripping sweat watching them dance so gracefully in the heat, I can only imagine how they were feeling! 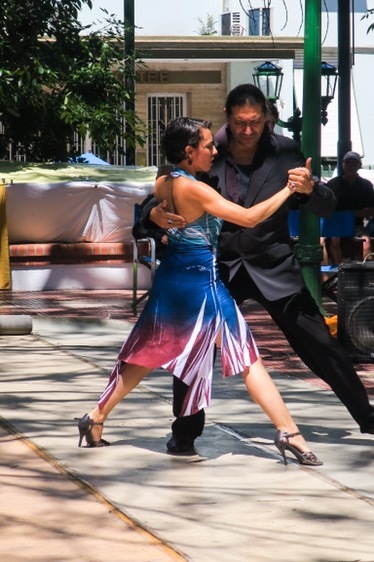 The tango seemed to be around every corner. We saw numerous shows as we made our way through the market. 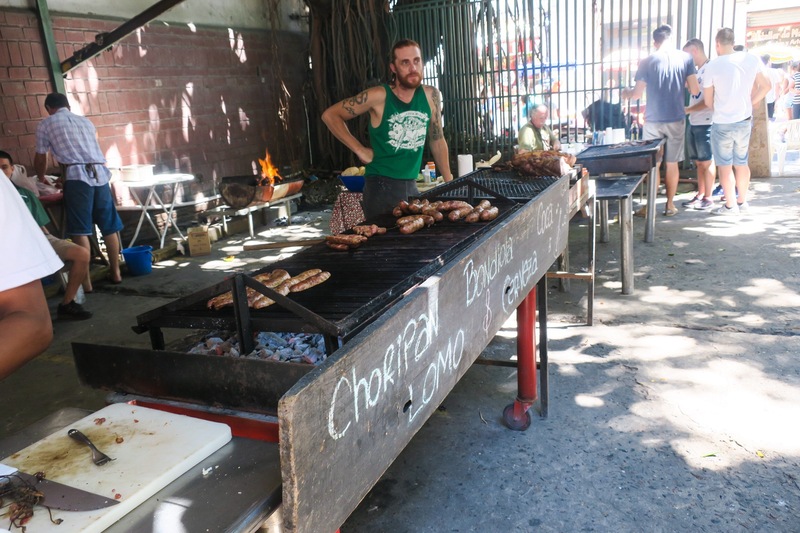 There was even a place selling Choripan, which is grilled Argentinian Chorizo. Much different than the Mexican/Spanish kind. 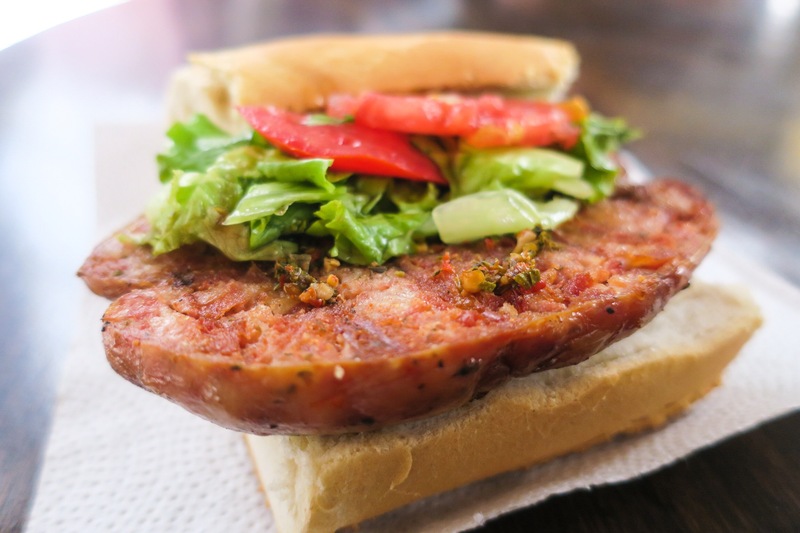 Not as fatty as Mexican chorizo but instead more corse in texture and not aged like Spanish chorizo. They served it in baguette with chimmichurri and Dean was in heaven. Sitting down and eating that, while taking a break from the sun in the shade and watching a Tango show completely made the day. Buenos Aires has a hop on, hop off tourist bus called Buenos Aires Bus, and we thought it would be perfect for us. For about $30/person you could use this bus to go virtually anywhere in the city for 24 hours. We bought our tickets in the evening so we were able to use it at night and the entire next day. 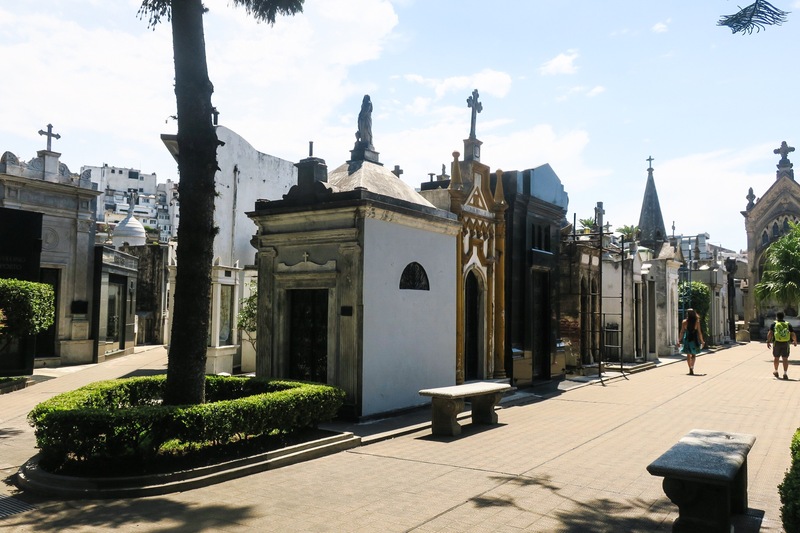 While you’re on the bus, you learn all about the sights while cruising down the streets of Buenos Aires. It’s a double decker bus… so make sure you wear sun screen! 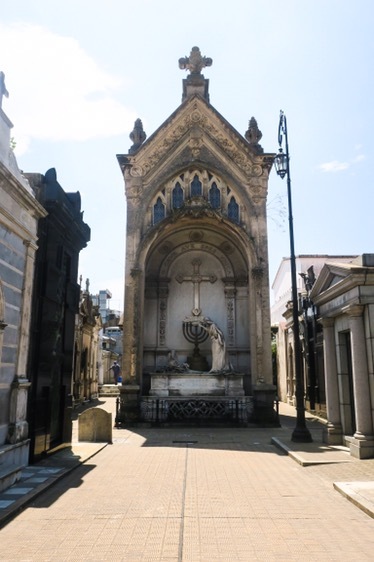 We had to stop at the famous Recoletta Cementary as everyone we talked to who had been to Buenos Aires told us we had to check it out. 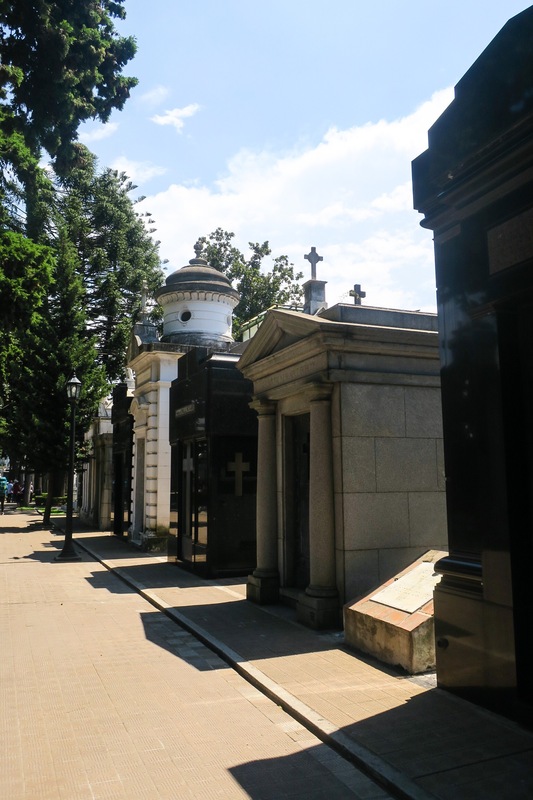 A huge cemetery filled with the who’s who from Argentinan history. 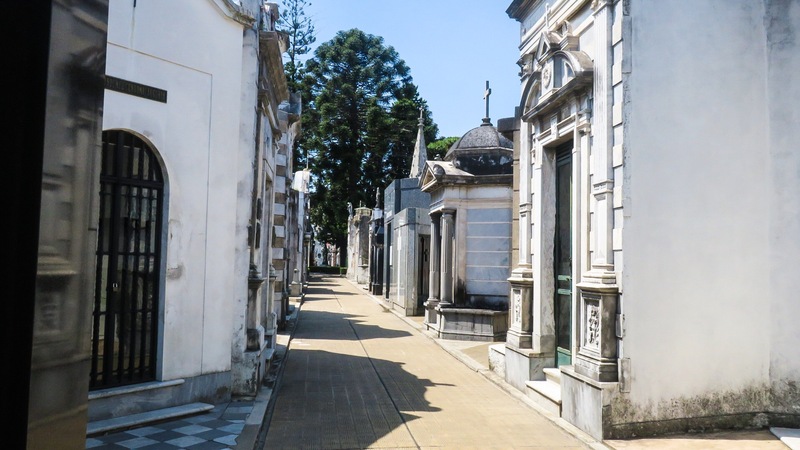 Many ornate, marble mausoleum’s filled with doctors, lawyers, war heros, etc. Each one was unique in its own way and you could feel the history racing around every corner. (Or were those the spirits…?!) It was definitely a must see in the city. As we mentioned earlier, Palermo turned out to be our favorite neighborhood. It had a huge variety of restraunts and lots of shopping. The streets are tree lined with lots of shade and had both big name stores and small boutiques. We visited their outdoor outlet mall as well. Palermo does lack the classic architecture that you see around the city, however, so if that is important to you, it should be noted. 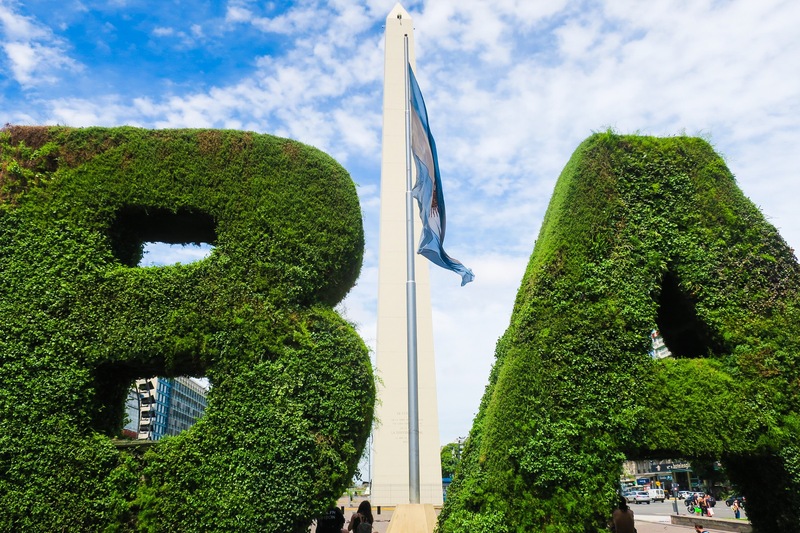 We vote, stay here and use the Buenos Aires bus to get yout fix of the other areas and monuments. Where Did We Eat? Make sure to bring your cash when you visit! While there are a lot of places that take cards, we found ourselves passing up a lot of great looking restaurants because we didn’t have enough cash on us. Also, some things to note, 1) while the servers make a more decent wage than those in the US, it is customary to leave about 10% tip. 2) All sit down restaurants have a cover charge. A flat fee that gets added on to the bill to cover the bread and dip they bring, table clothes, napkins etc. It ranges from restaraunt to restaurant and is a per person charge. 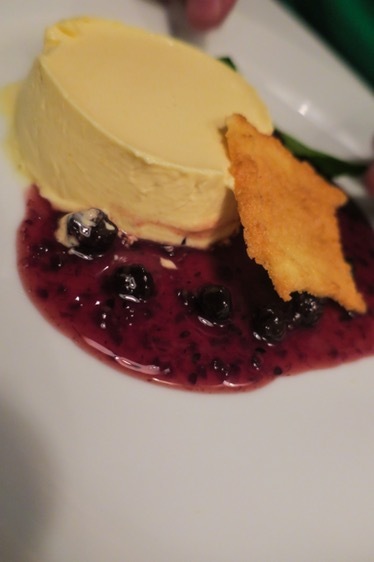 La Parolaccia del Mare: Located right in Puerto Maduro, a trendy neighborhood right in the river, this Italian restaurant was the best deal we found. For around $27/person you get an appetizer, entree, dessert, water/soda, wine, coffee/tea, pettifours and a shot of limoncello. We were completely stuffed after and the food was delicious! A nice bottle of Malbec was brought out with a huge display of fresh bread and kept it flowing throughout the night. 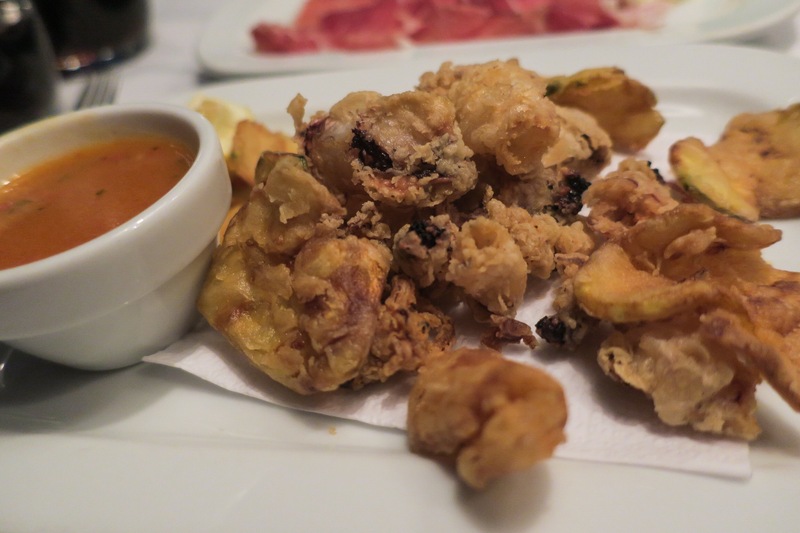 I started with Calimarri Fritti, crispy fried squid with marinara dipping sauce. 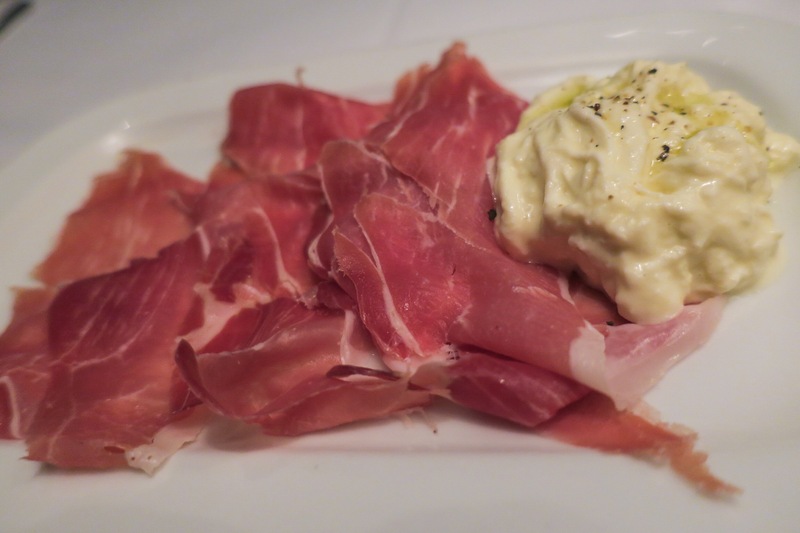 Dean got creamy Burrata and thinly sliced prosciutto, it was cut so thin it just melted in his mouth. For entrees we both got Pollo Egean (Aegean Chicken, yet there was nothing Aegean about it! 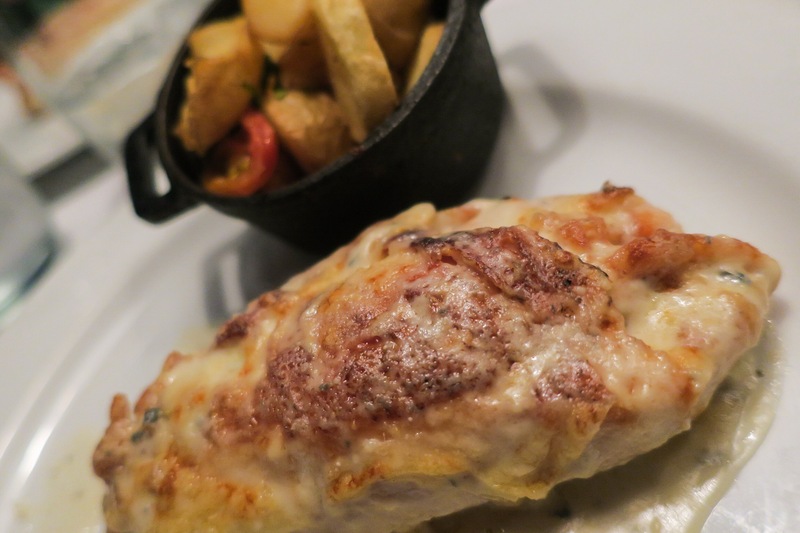 ), it was simply a chicken breast cutlet rolled with ham with a blue cheese sauce. Regardless of the name, it was delicious and we gobbled it up! 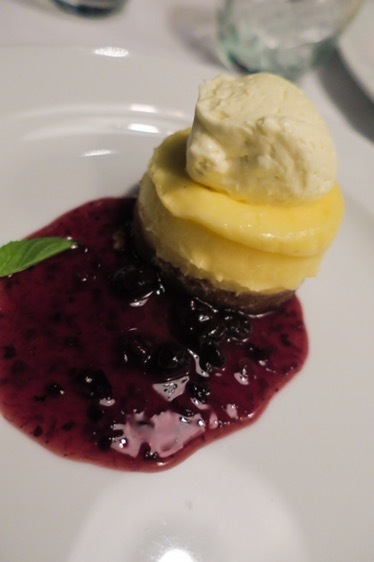 Dessert consisted of Tarta al Limon for me and Maracuyá (passion fruit) pannacotta for Dean, both with a housemade fresh berry compote. 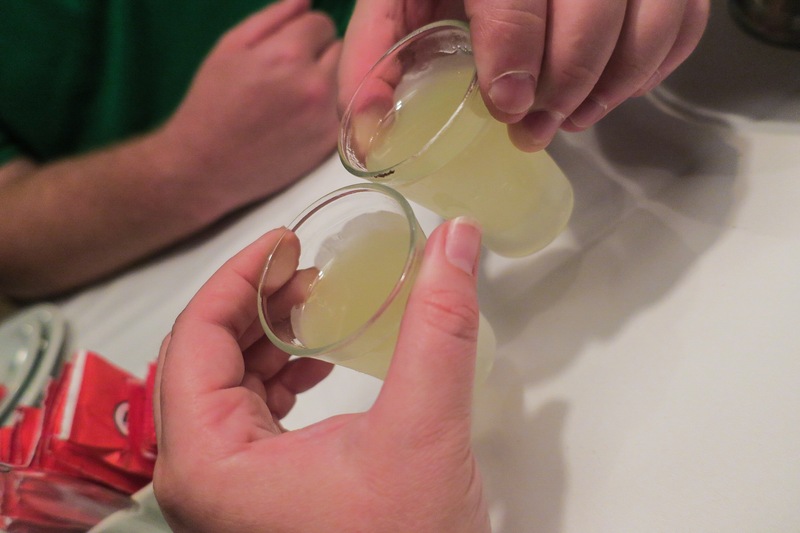 The evening ended with the traditional espresso service, petifours and shots of ice cold syrupy and sour limoncello to send you out the door. Muy bien! La Churrascarita: After striking out trying to go to a hip butcher/restaurant place in Palermo that was completely booked for the night, we faced the dilemma of finding a place to eat that was accepting walk ins. 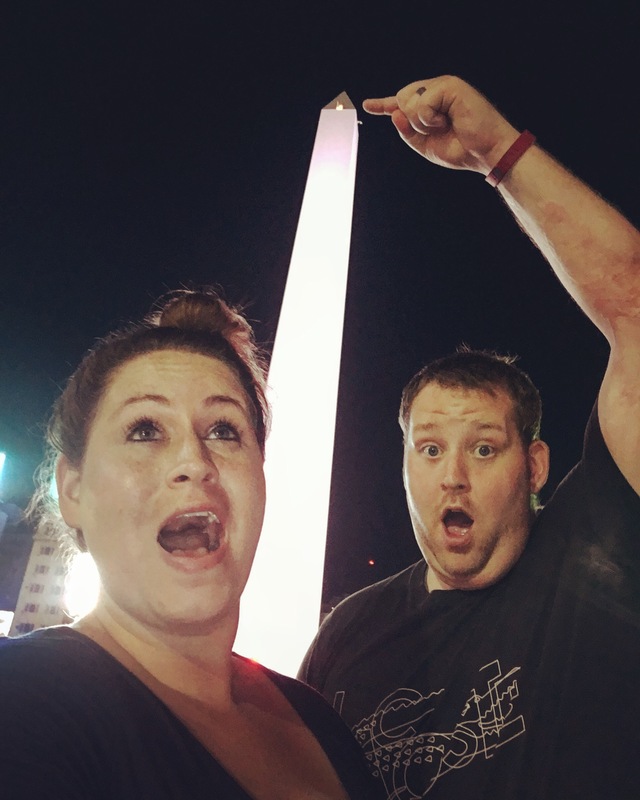 We decided to head back towards the Obelisco, closer to our hotel. 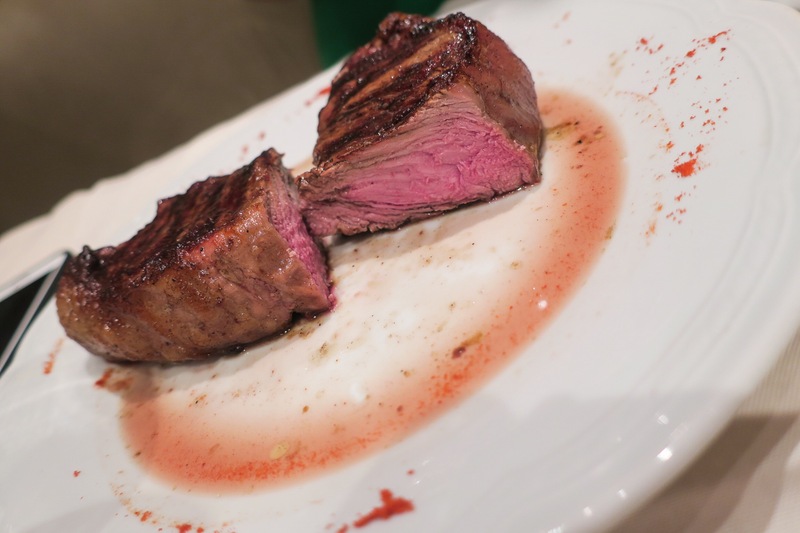 We had walked past La Churrascarita previously and decided to give it a shot. It was in the “theater” district, so think of eating in a 1970’s style pink restaurant, with white table cloths, preset wine glasses and nicely dressed waiters, perfect if you’re 65+, for us, not so much, but each minute was making us more and more hungry so, this was it! Being in a touristy area the prices reflected this, but were still reasonable. We both decided a bottle of Sparkling wine for 150 pesos (~$10) would be a nice change from just water and soda, and ordered our meals. 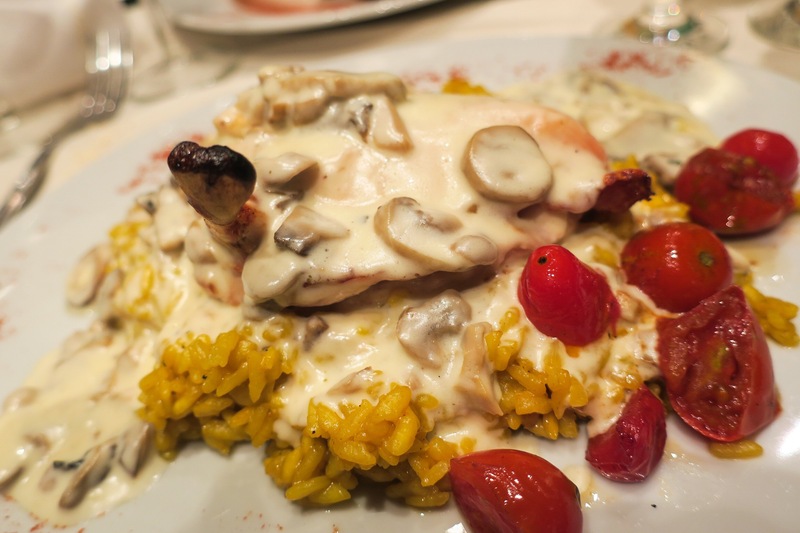 I got the Chicken breast topped with a creamy mushroom sauce and risotto style rice. It was a huge portion and absolutely delicious. Dean got the Bife de Chorizo with Spanish Potatoes and Chimichurri. A Bife de Chorizo is not what it sounds like! It’s not, chorizo but instead a NY strip! If you’re a lover of beef, make sure to order it “muy jugoso” (medium rare), if not you’ll get a overcooked (by Dean standards) piece of beef. Far from what you may think, Chimichurri here is not a condiment that is served everywhere, or on everything. It’s also not bright green! It’s best when marinated for a few days and ends up turning more of a reddish/brown color from the chili peppers. La Churrascarira wasn’t the best place, it definitely wasn’t the worst and we were very satisfied with our meals. 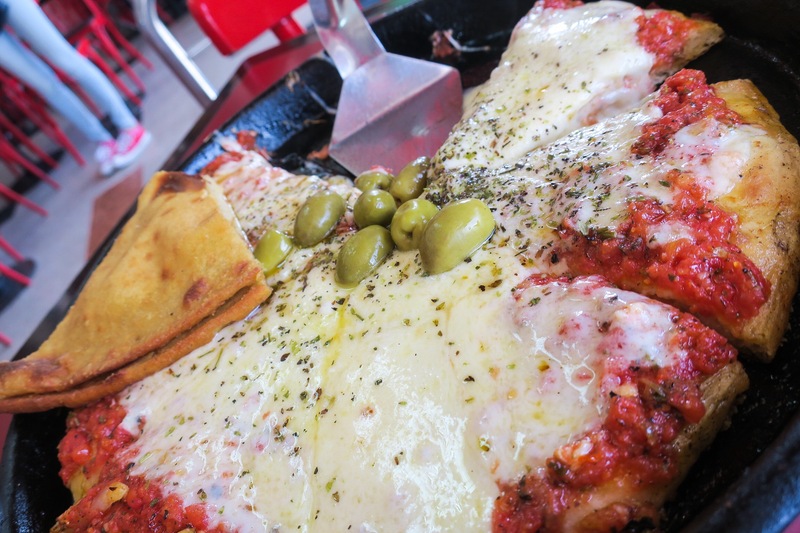 Kentucky Pizza: We had heard the pizza in Argentina was worth trying, so when we saw a sign outside a pizza place that said 210 pesos (~$14) A large Muzza (mozzarella) pie with 2 pieces of Faina (chickpea pancake) and a 1.5l of the ever popular flavored water, we were sold! Turns out, Kentucky pizza is like a Pizza Hut, a big chain with locations throughout the city. Still a great deal! 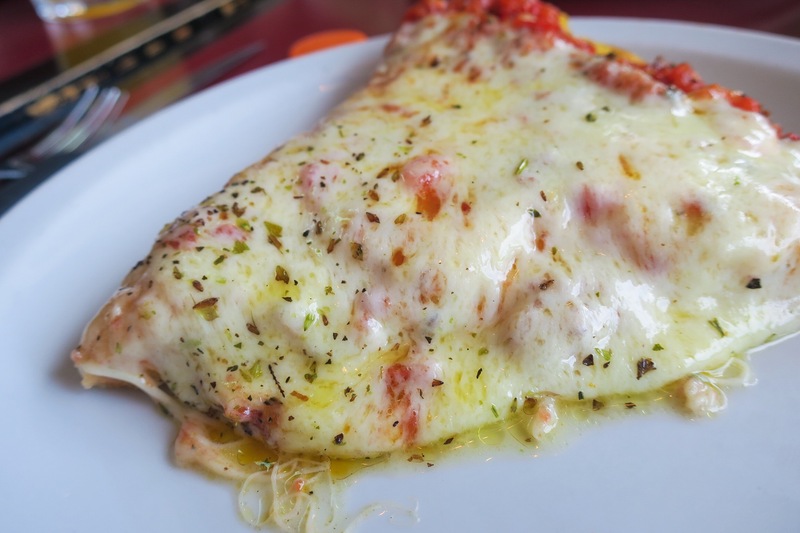 The pizza was delicious, lots of stringy cheese with a crust between a Chicago style deep dish and a NY Style pie. We were very happy! Las Mil y Una Noches: Being in South America for a while made us crave some spices, as that seems to be lacking in most of their food! 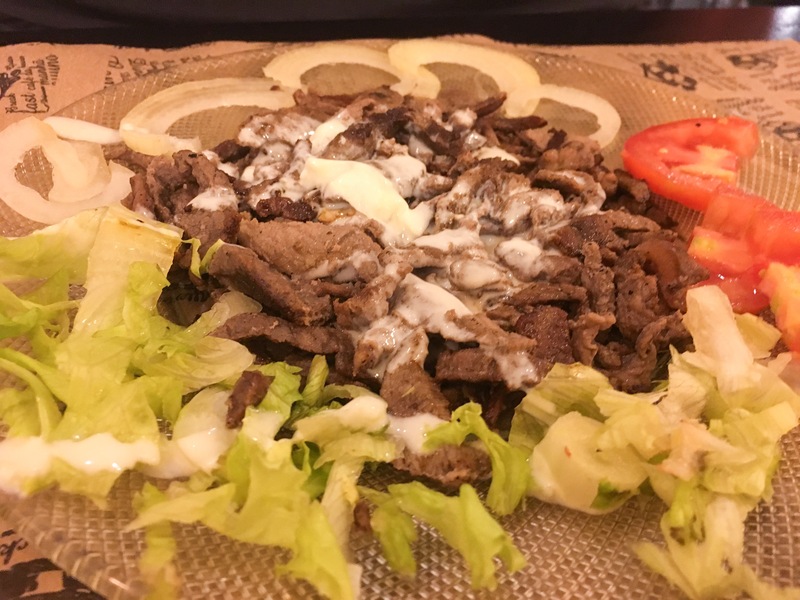 When we saw this Middle Eastern place on yelp, we knew we’d get our fix. 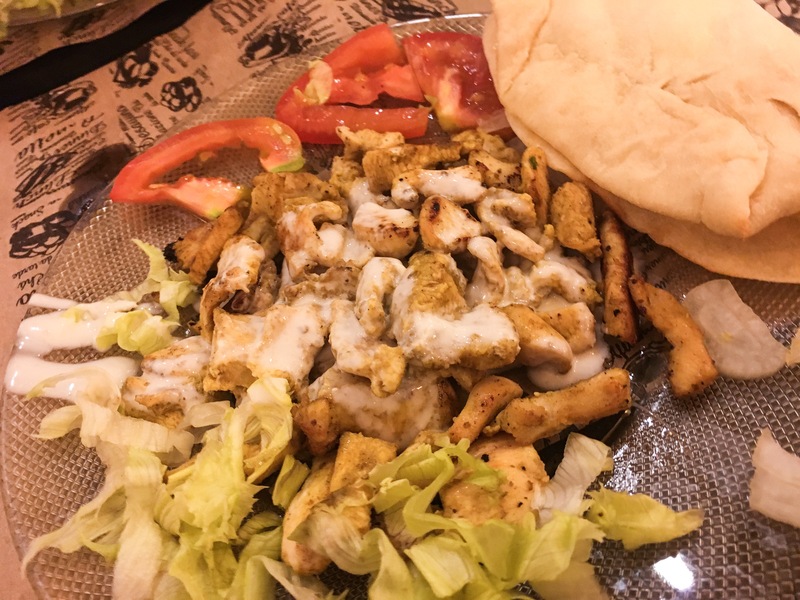 I got the Plato de Pollo, and Dean got the Plato de Carne, and we decided to share the ummus (yes, no H) with some pan aribe (kind of like a mix between puta and naan bread). 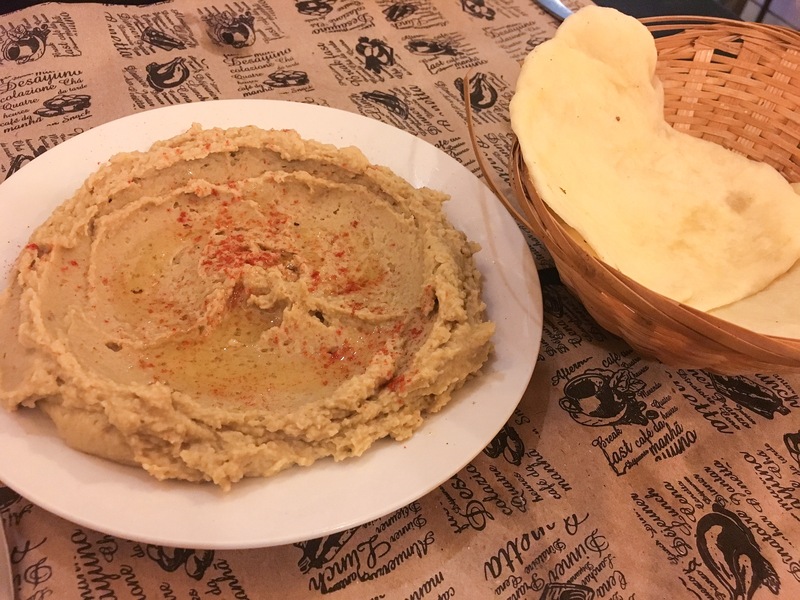 The ummus was nice but was lacking that punch in the face of tahini, garlic and lemon, it clearly had been altered for the local flavor profile, but we still gobbled it down. Both of our platos were good, not amazing but still hit the spot of mas sabor (much flavor). For $290 we got our ummus, 2 platos and 2 cans of soda. A great meal for a great price. 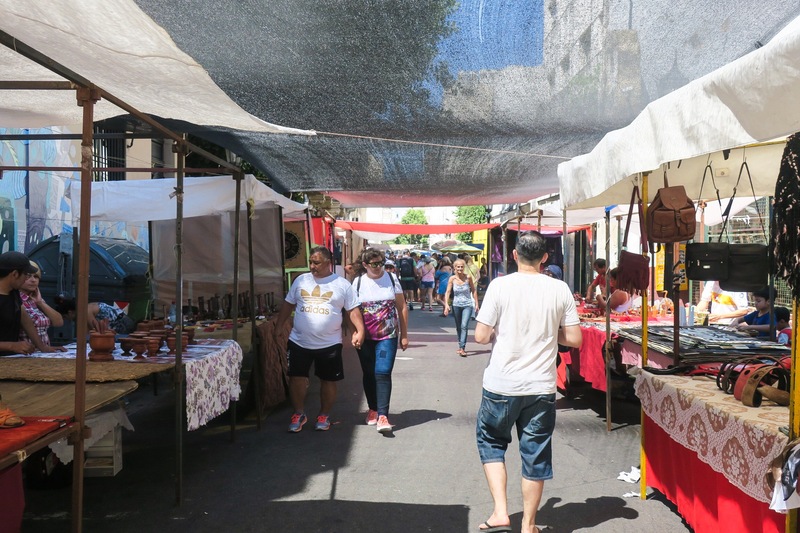 Fring: After not doing our research and learning that Palermo is pretty much a ghost town on Mondays, we had ended up in that neighborhood with nothing to choose from. There was a Mexican place Donkey and Friends, but cash only, so that was out. We walked by Fring and were happy that theh took cards, had A/C and were open. Finding this place was a nice surprise! 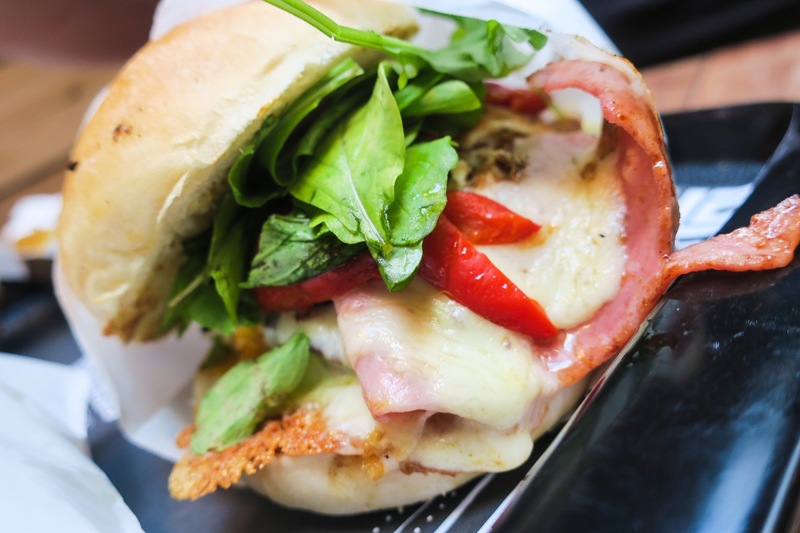 A burger joint with international and regional topping for the burgers, the Criolla (Argentinian), the Zidane (French) or the Sanchez (which you would think would be Mexican or Spanish given the name, but was ham, cheese and egg) and many more. They also had “international” French fries, the New York (cheese whiz and bacon), Madrid (super garlicky aioli) or the Hanoi (cilantro and lime) just to name a few. Plus aros de cebolla (onion rings) with different flavors. I got the Arizona. 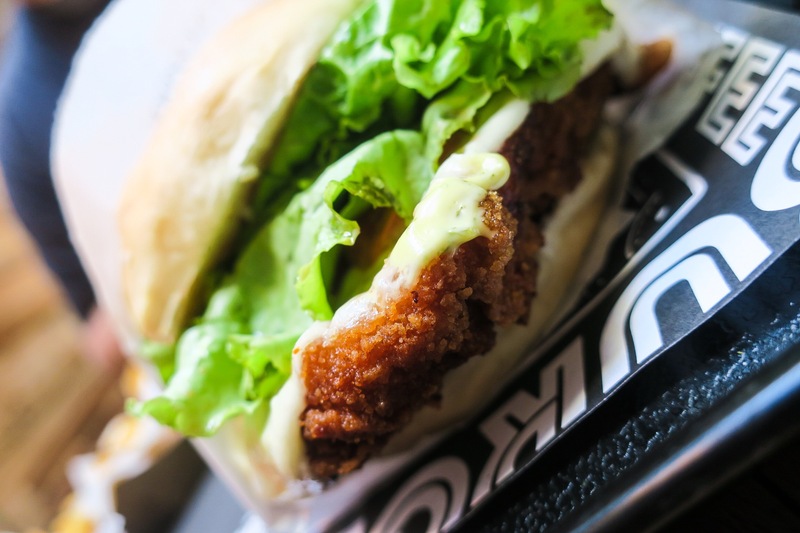 A crispy chicken burger with herb mayonnaise, tomato and lettuce and Madrid fries. Dean got the Sanchez with Bravas fries. He asked if the bravas was picante, and was told it might be, so they put it on the side. 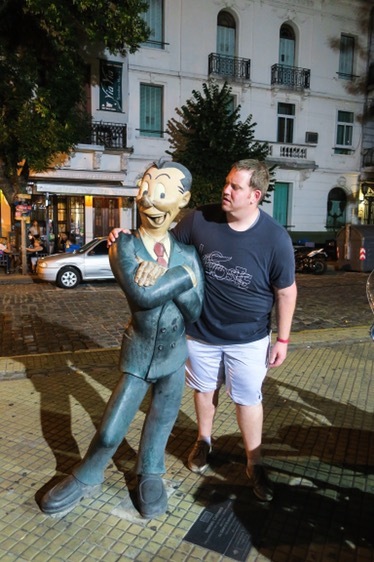 We learned throughout our time in Argentina that the locals are very sensitive to spice! What they think is spicy is not even close to US standards. Pretty sure it was tomato sauce, nothing “brave” about the bravas sauce which is supposed to be very spicy. The burger was great, perfectly cooked burger with a pan fried egg, ham, mozzarella cheese and arugula, only thing missing was a knife to cut it in half and let the egg yolk drop out. London City: Tourist. Trap. We went here when while continuously failing to find open places somewhat close to our hotel. It seemed to be here or McDonalds. Let’s just say, we wished we picked the ladder. We had been craving some pasta so that’s what we got. Dean got spaghetti with bolognese and I got chicken and vegetable ravioli with mushroom cream sauce. The whole thing was a disgrace for food. We’ll leave it at that. 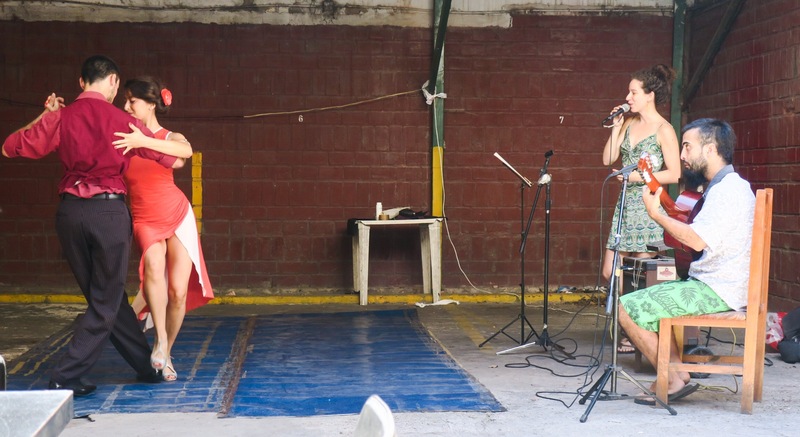 As our first month comes to an end, so does our time in South America. It was a gorgeous continent and we learned so much about the different cultures, cuisines and lifestyles. We will definitely be back for more! Next stop, pretty much on the opposite side of the world…New Zealand! 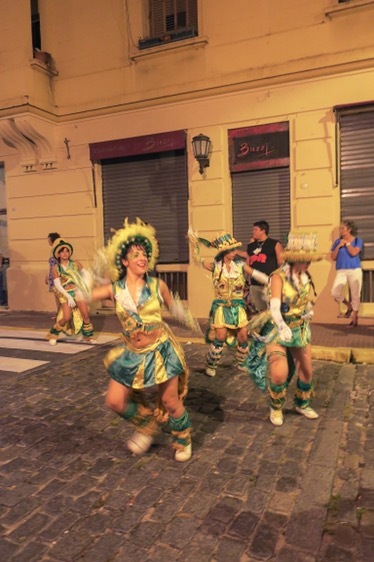 Previous PostMendoza, Argentina: Great Wine, Great Food…How Are These People Not Fat? Next PostNew Zealand: First, the North Island!